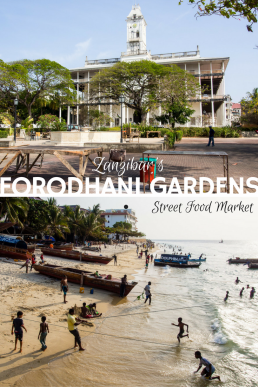 Everything you need to know before visiting Forodhani Gardens in Stone Town, Zanzibar! What to eat at Forodhani street food market and how to be safe, best spots to watch the sunset at the seafront and photograph fishing boats. Read on to learn more about Zanzibar pizza and other Tanzanian street eats! Every night Stone Town’s Forodhani Gardens turns into a busy street food market selling fresh seafood and local delicacies, such as Zanzibari pizza. 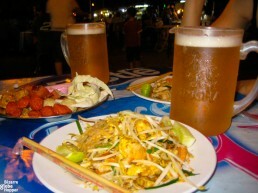 Walk by the seafront watching the sunset over the Indian Ocean while sampling street food with locals! Forodhani Gardens is located inside Zanzibar’s historical Stone Town, by the seafront, and along the main promenade. Finding Forodhani Gardens is easy: Just walk towards the seafront, ask from your hotel or any local, or check the location from Google Maps. 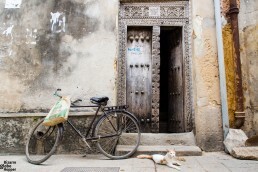 If you’re already done either guided or independent walking tour in Stone Town, you will know the location by heart. Arrive early to experience the unique atmosphere of Forodhani Gardens before the night food market begins. 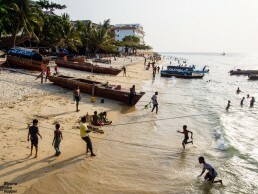 While fishermen drag their wooden dhows back to the sand, street vendors slowly set up carts and makeshift tables in the leafy walkways of Forodhani Gardens. Walk towards the shore and take a seat at the seawall, watching tens of boys jumping off into the turquoise waters with the last rays of the sun. 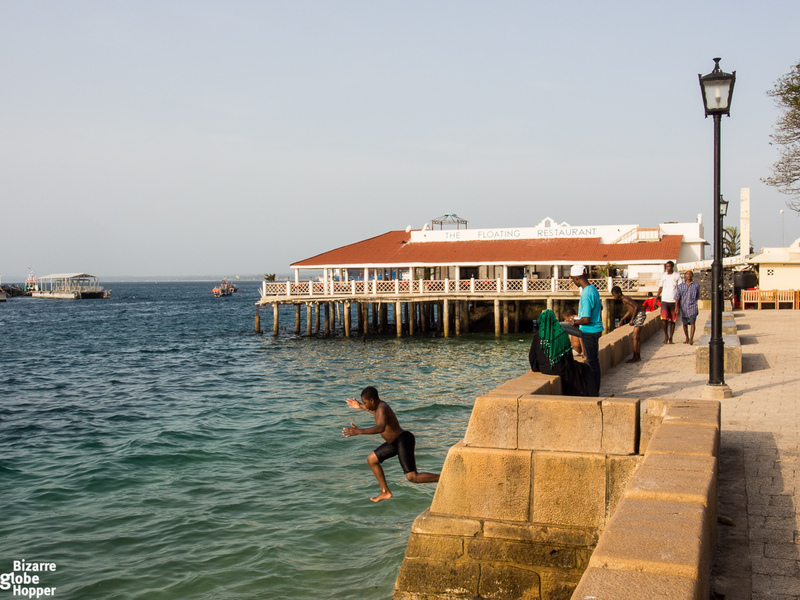 The seawall by Forodhani Gardens is the best place in Stone Town to take sunset photos. While you’ve enjoyed the sunset at the dock, the Forodhani Gardens has already transformed into a lively open-air street food market, where locals and tourists alike stroll between the food stalls. 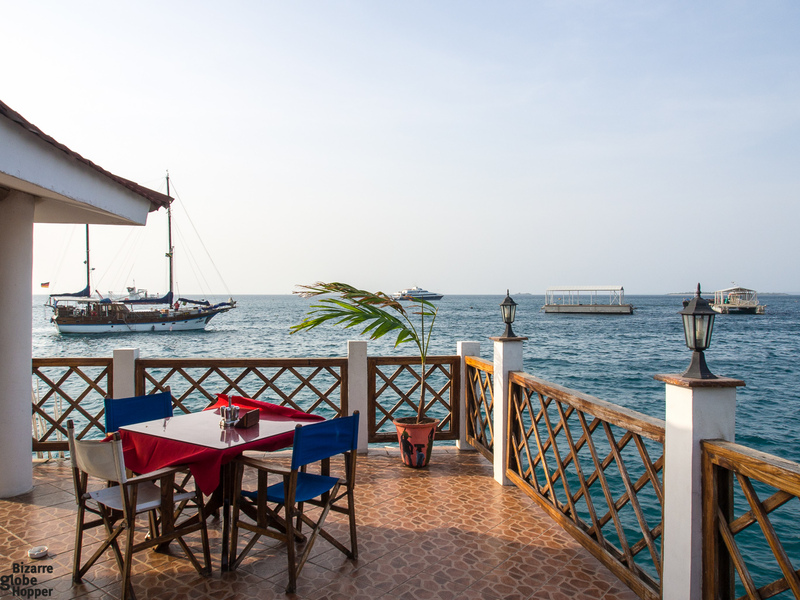 Join the crowds and follow your nose to pick Zanzibari and Swahili delicacies, such as grilled lobsters and calamari, meat skewers, and samosas. 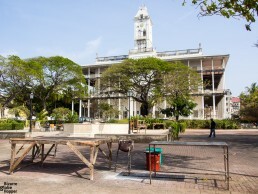 The bustling place of assembly, called Forodhani Gardens, is set out between the Indian Ocean and Stone Town’s most iconic buildings, like The House of Wonders and Old Fort. Forodhani Gardens received a whopping 2-million dollar facelift in 2009, and Zanzibaris are really proud of it. Is Forodhani Gardens Street Food Market Safe for Tourists? As with all street food markets in Africa, you should follow your guts and be vigilant. The street food stalls don’t match with the Western hygiene standards, and cold chain might be broken. Please consider the risks of eating street food before diving in. The night street food market gathers crowds, which bring in the opportunistic pickpockets. Watch your belongings and take only small money to avoid big losses. Also, beware of scam waiters who take orders and cash without representing any restaurants. If someone tries to sell you a beer, it’s a scam, as alcohol is not allowed in Forodhani Gardens street food market. Drinking alcohol might even get you in trouble, so leave it to nearby bars. The Floating Restaurant at the port is stilted upon the ocean (not floating, though): it’s perfect for sunset drinks. Some street food vendors can be really pushy. If you are not interested in their offerings, please tell it firmly to get rid of them. Otherwise, they can harass you through the evening and even throw a tantrum if you shop in other stalls. Forodhani Gardens Food Market’s selection might be overwhelming, and many tourists ponder whether it’s safe to eat street food, especially seafood. Thus, we listed the most popular dishes and further tips for avoiding stomach upset and food fails. Fresh Seafood and Barbequed Meat – On Skewers! Forodhani Gardens is an excellent – and affordable – place to sample seafood if you’re convinced that it’s fresh. Lobsters, crabs, squid, shrimps, and octopus are abundant, together with tasty fish, such as barracuda. Still, it might not be the freshest seafood around, so follow your nose and longest queues to find the best stalls. Forodhani Garden’s most famous dish is “Zanzibar pizza”: a weird mix of veggies, seafood, chicken, or beef mixed with egg and mayo and wrapped in fried dough. When the chef is piling your choice of fillings on the thin batter, it still looks like a traditional pizza. Then, an egg and mayo are drawn in, and the thing is crowned with another thin layer of dough, just like calzone. Finally, Zanzibar pizzas are fried in ghee until decadently crispy. Spice Island lives up to its name: most foods are cooked with exotic spices, such as masala, garlic, cardamom, saffron, and turmeric to name a few. Thanks to Zanzibar’s history as a melting pot of cultures, the Zanzibari cuisine has Indian, Arabic, and Mediterranean influences. 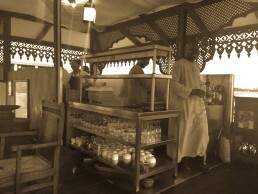 The dishes that we tried at Forodhani Gardens weren’t “hot” at all: we even asked for some extra spices! Refreshing sugar cane juice well with any dish – add a dash of lime and ginger to boost your immunity! The stalls sell many kinds of Swahili doughnuts, like vitumbua, kaimati, and mahamri. You can even have a Nutella or Snickers pizza for dessert! While some tourists have eaten the best dishes of their trip in Forodhani Gardens, the others report poor food quality and stomach upsets. Always agree on the price before ordering to avoid being charged tourist prices. Only order food at the stalls, not from the touts. Make sure your meat or seafood is well cooked to prevent salmonella and parasites. We had just small bites and didn’t have any problems. The food we tasted was good, but not outstanding. 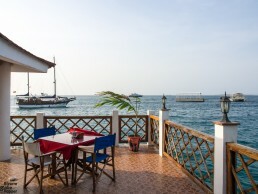 For safe culinary exploration in Stone Town, we recommend a sunset dinner at the rooftop of Emerson Spice. If you’re looking for stunning beaches and all-inclusive resort culinary delights, we recommend a relaxing stay at Baraza Resort & Spa. If you doubt your tolerance, please just skip the street food and explore the grounds of Forodhani Gardens. It’s well worth watching at least one sunset from the seawall with locals! Have you visited the Forodhani Gardens street food market, if so, what was your favorite dish? Just before sunset, small food carts gather around the old pier of Nathon in Koh Samui. This is where we’ve eaten the best pad thai of our lives. 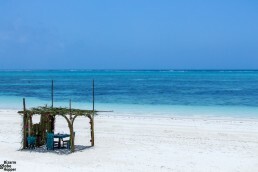 Mr Zanzibar does a delicious fish pizza at Forodhani Gardens – highly recommended! And their banana and nutella pizza smothered in chocolate sauce is enough to make Elvis Presley turn in his grave! Such sweet memories. I also fully endorse your Emerson Spice dinner recommendation – a wonderful experience. Everywhere I went in Zanzibar I had such lovely meals. I would return in a heartbeat. Hi Diane! Thanks for the tips, sounds sweet! We were also happy to stumble upon delicious food in Zanzibar. I particularly loved a tiny organic café called Lazuli, their smoothies are to die for. I think we will write a separate post about a dinner at Emerson Spice, it was such a special treat with picture perfect sunset views.